I debated for a few weeks whether to do cupcakes or cake pops for J's birthday. We had some really adorable cupcake ideas, but I just couldn't get completely inspired. Days before J's birthday I finally decided we'd go with cake pops. This has proven to be one of my best decisions thus far in life! Yes, life! 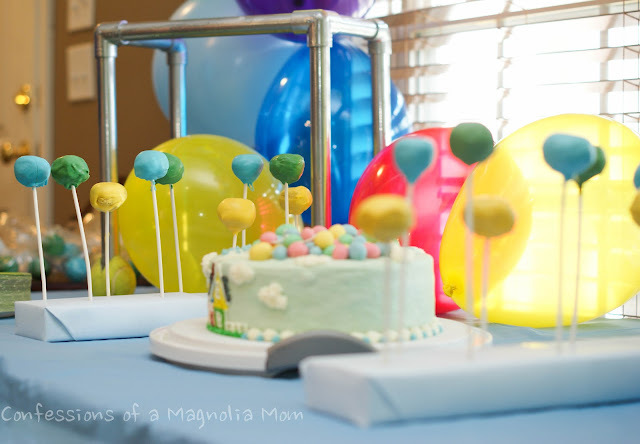 We began with custom cake pop stands. Because if I'm going to make these things, I needed to be sure I had somewhere to display them! 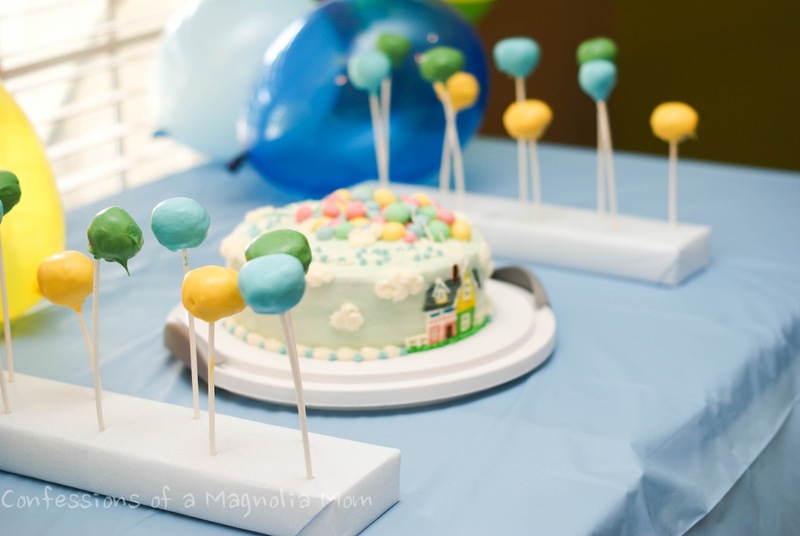 On each 2x4 measure out and mark the distance between where your cake pops will stand. 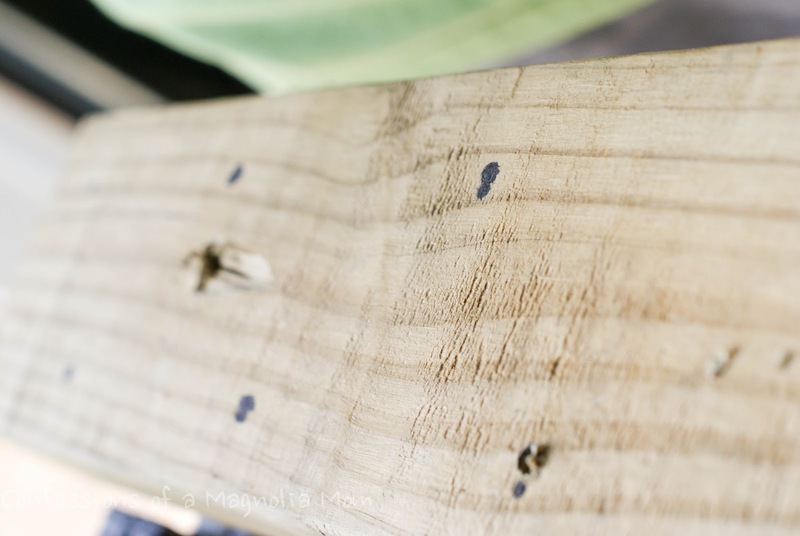 Take a drill, with appropriate drill bit size, and make yourself some holes. We chose to drill all the way through to ensure a sturdy pop. 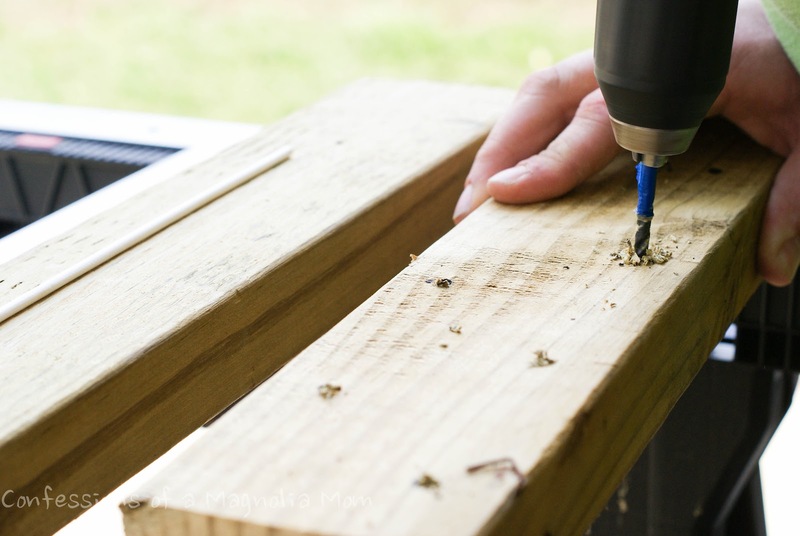 But many tutorials recommend drilling 3/4 through the 2x4. Sand down the holes as needed. 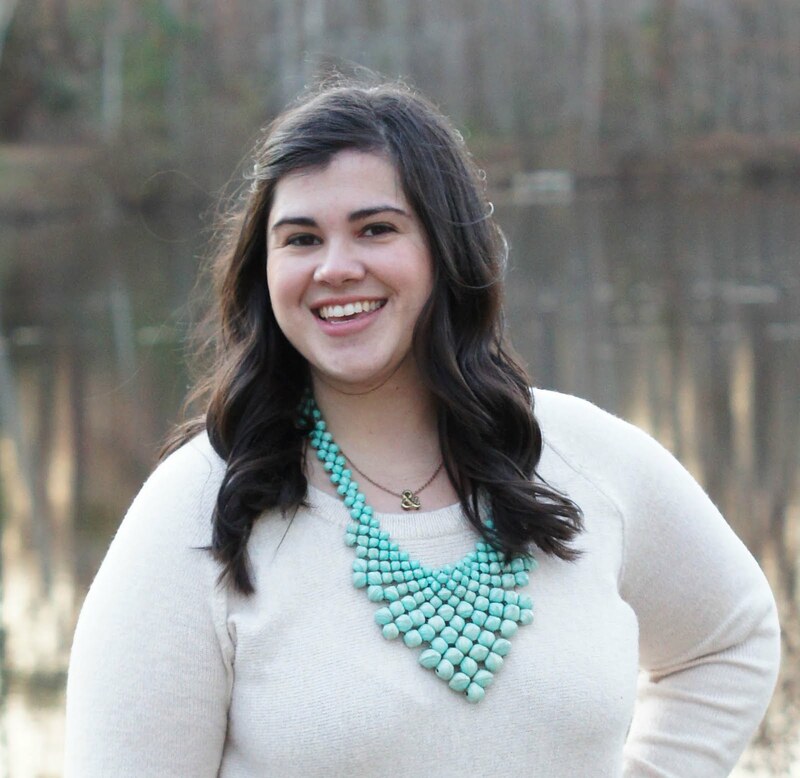 Grab some scrapbook paper, fold and tape. 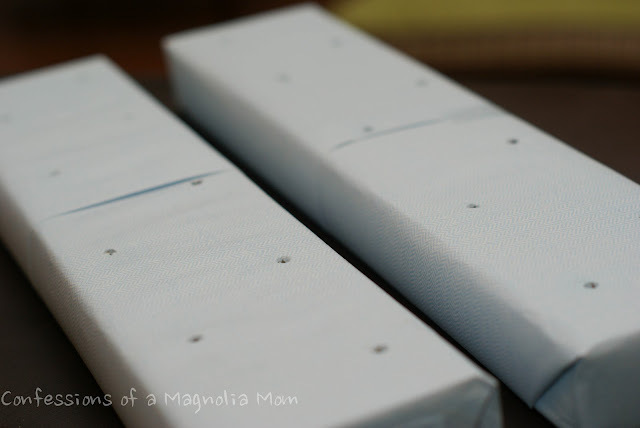 I simply folded around the edges of the 2x4 as if it were a present. Then we took our cake pops and punched through for our holes. This was such an easy DIY project and cost us just $1 for the scrapbook paper. We now have cake pop stands to use for all future events, just change the scrapbook paper as needed! Now, onto the good stuff...actually making some cake pops! 1. Cook the cake as directed on the box. 2. Once baked, crumble the cake. You can do this by hand or food processor. 3. Add 3/4 frosting container to cake crumbs until well mixed. 4. Form into 1 inch balls. 5. Take cake pop stick and dip into chocolate melts. Then place into cake pop. 6. Let cake balls set in freezer for 30 minutes. This will give a secure base for the cake pop. 7. Once the pops have set, take them out and get to dipping. Be sure to tap off the excess chocolate before placing to set. Once your chocolate has set your pops are ready to go! We even wrapped the cake pops in cellophane, gave it a ribbon and a tag and gave them out as party favors. 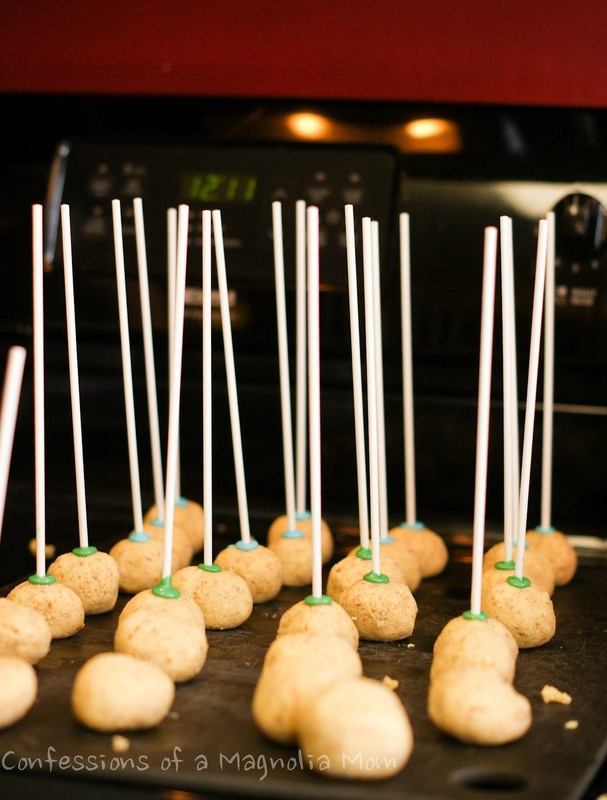 If you still haven't dabbled in the world of cake pops, you really must!